I’m Kevin Kosbab is a freelance writer and designer whose patterns for quilts and sewing projects appear in magazines including Stitch, American Patchwork and Quilting, and Quilter’s World. I produce modern patterns for creative quilters under the Feed Dog Designs label. Interweave released my video Secrets of Home Décor Sewing on DVD and as a download in June 2012. 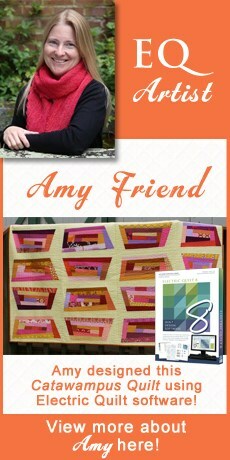 I”m currently working on my first quilting book, also with Interweave. I live in northern California with my partner and a handful of quadrupeds. Find out more on my blog or website. Like many quilters who lean to the modern side, I have lots of solid fabrics in my stash. I’ve also got a custom library full of them in EQ7. I know it sounds crazy—after all, solids of virtually any color are right there in the Colors tab of the Paintbrush palette. Bear with me: there are actually several reasons why a library of solid swatches isn’t as counterintuitive as you might think. The built-in solids are screen colors. This makes them great for keeping file sizes down, but it also means they use the full color range of your computer’s monitor, and pixels can show more intense, saturated colors than typical dyed fabrics. Solid swatches don’t have any info other than RGB values in your project’s Sketchbook. Again, this keeps file sizes down, but if you want to use the Sketchbook to keep track of manufacturers or color names for your solid fabrics, you’re out of luck. To design with actual solid fabrics, I’ve built up an EQ7 fabric library with swatches of solid fabrics downloaded from their manufacturers’ websites. The color accuracy is as good as what the companies uploaded to represent the fabrics online (which unfortunately means some are still digitally generated), and I can choose solids in EQ that I know I’ll be able to find in my stash, get at a local fabric shop, or order from an online store. They stay in the Sketchbook just like other fabrics, so I’ll have a record of what exact fabric I decided on even if I set the project aside for a few months. The Notecards for the fabrics indicate the color number and/or name assigned by the manufacturer, and the library is organized by manufacturer and line to make it easy to work with as many or as few lines as needed. You can download a copy of my solid library and add it to your own EQ7. Follow the instructions for linking Monthly Libraries, but put the solids library file in its own folder and link it to EQ as “Solids Library”. The file will show up in your Fabric Library under that heading as “Solids by Manufacturer,” with lots of companies’ quilting solids listed within. And they’re all up to date with the latest color additions as of July 2012! 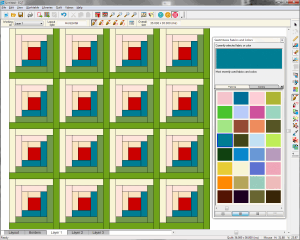 I usually don’t start coloring quilt designs with the this library though—I design a quilt using EQ’s built-in solids and then get EQ to show me the best matches from my custom solid library. Here’s how. 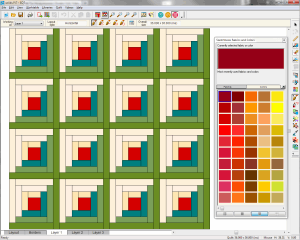 Open a project or design a new quilt and color it with the Paintbrush tool, using only the Colors tab (no scanned fabric swatches). Save the quilt to the Sketchbook. 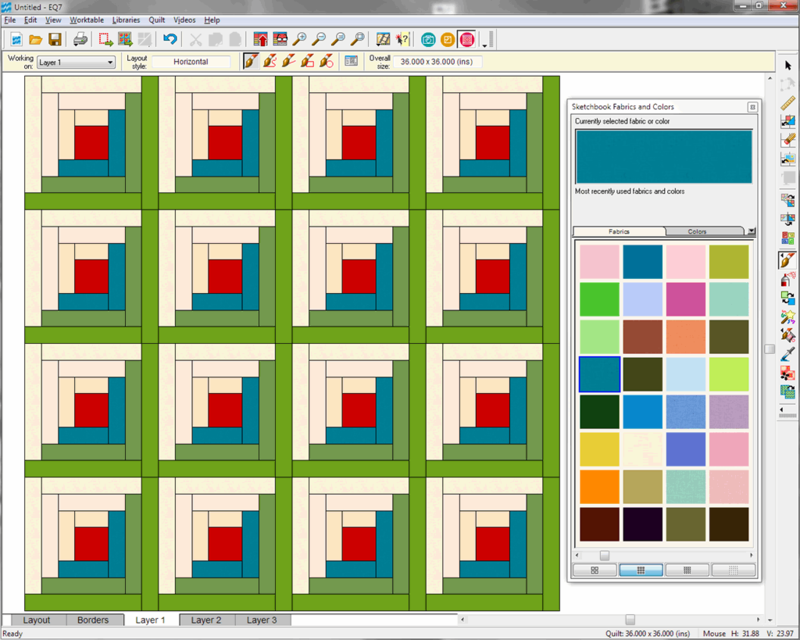 For this example, I’ve pulled a precolored log-cabin block from the Block Library and set it into a basic layout. 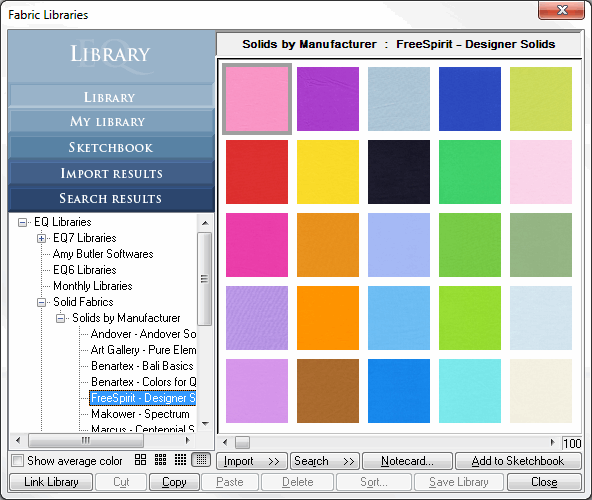 Open the Fabric Library and choose the Sketchbook section. 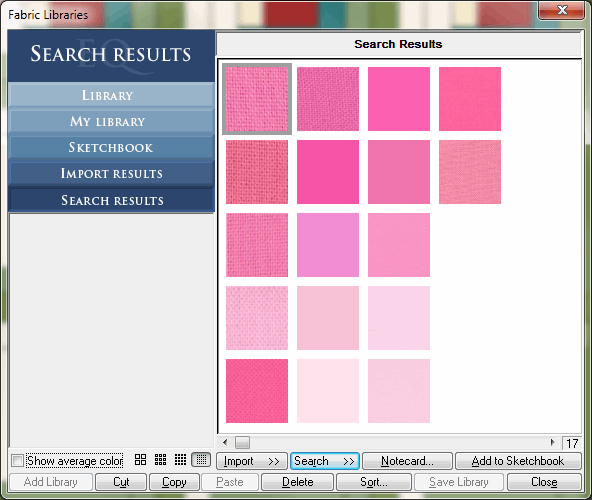 Select all the swatches in the Sketchbook (use Ctrl+A to select them all at once) and delete them. Your Sketchbook should be empty of fabrics. 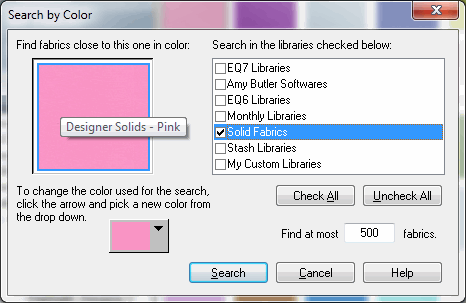 Still in the Fabric Library, locate the Solids by Manufacturer library under the new Solid Fabrics category. Choose one or more lines of solids to convert your colors to—for this example, Robert Kaufman – Kona Cotton. Select all the swatches from the line (Ctrl+A) and click Add to Sketchbook. The only fabrics in your Sketchbook will now be the solids you’ve picked. 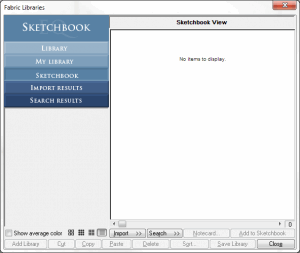 If you like, add more lines to your Sketchbook the same way, then close the Fabric Library. 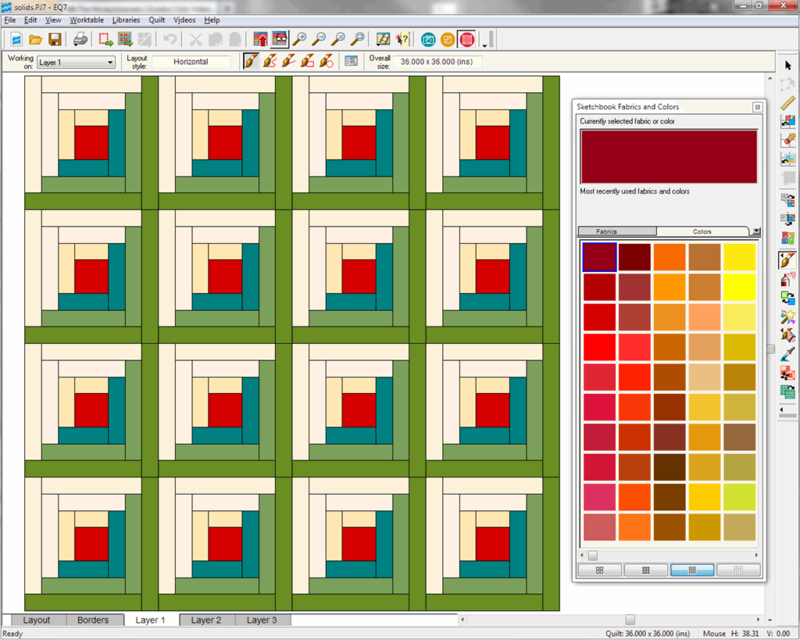 On the Quilt Worktable, select the Random Recolor tool. 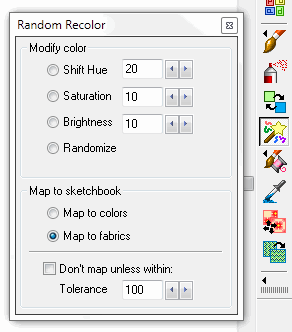 Choose “Map to fabrics” in the tool options pop-up. Click on the quilt and EQ will swap out each color in the quilt with the solid swatch from your Sketchbook that most closely matches. (Search the EQ7 Help for “random recolor tool” for details on how to use the Tolerance settings if you want more control over the recoloring.) 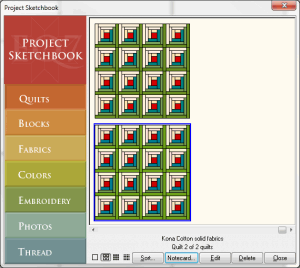 Add the quilt to your Sketchbook, where you can compare the two versions. To find out what solid fabric has been swapped in for a particular color, use the Eyedropper tool to click on one of the fabrics in the quilt. I clicked on the teal in the log cabin. The fabric you click will be highlighted in the Paintbrush palette, and if you hover your mouse pointer over the swatch in the palette, the color name will appear as a tool tip—for my teal, EQ used Kona Glacier. 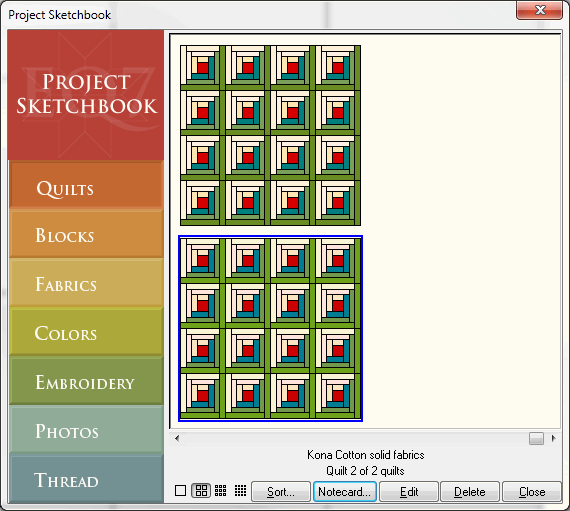 To determine the color number, locate the fabric in the Sketchbook and view the Notecard. Keep in mind that saving scanned solids in your Sketchbook and coloring with them will increase your project’s file size, so it’s still generally best to use the built-in colors for sharing quilts by e-mail or elsewhere online. You can also use the solids library to search for solids by color. 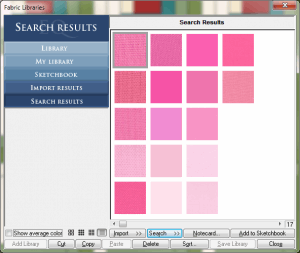 In the Fabric Library, select any fabric—solid or print—and choose Search by Color from the Search button flyout. The search dialog box will show the selected swatch as well as its average color—the “average” color of a solid should look pretty much the same as the swatch, as it does here where I’m searching with Pink from FreeSpirit’s Designer Solids line. Make sure the only box checked is the one for the Solid Fabrics library, adjust your “Find at most” number if you like, and run the search. The results will show you similar solids from across the manufacturers—my pink search came back with 17 results from Moda’s Bella Solids, Michael Miller’s Cotton Couture, and other lines, including a few related shades from within Designer Solids. Once you’ve got the names or numbers of the solids you need, it’s easy to make up a shopping list for your local quilt store, order fabrics online, or compare with your own stash—that is, if you can remember the names for all those piles of cut yardage! Learn the benefits of designing with solid colors in EQ from FeedDog!